1. Making sure to cure between each step and layer, coat the nail with a The Gel Bottle (TGB) Rubber base, then cover the nails with two coats of TGB Lavender, or another violet-colored gel-polish. 2. Using a detailer brush and a white gel-polish, create an outline, then fill in the base layer of the corn. 3. Paint over the corn with its base colors: yellow, dark green, light green etc. Once cured, start adding dimension and shading with a detail brush, flash curing for 10 seconds between colors. 4. 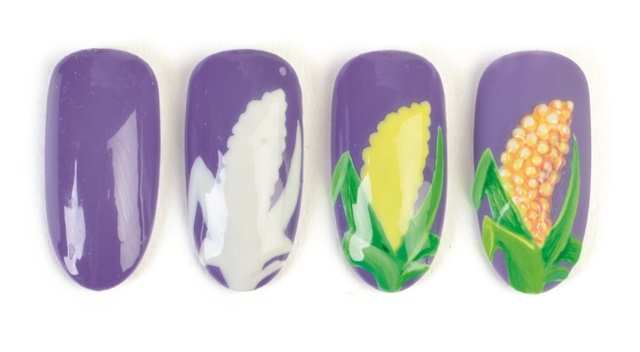 Add more definition using a detail brush on the outlines of your leaves and around the little corn pieces, cure, and cover the whole design with TGB matte top coat. Once cured, add the tiny little dots on top of the corn pieces with TGB Rubber top coat (or other thick top coat) to create a 3-D effect.